Gain the managerial skills you need to succeed in a variety of career fields. * Depending on transfer credits. Alvernia University is accredited by the Middle States Commission on Higher Education. Highly trained, effective managers are always in-demand. You can prepare for a management role in a variety of settings with Alvernia University’s online business management degree. Through a program accredited by the Accreditation Council for Business Schools and Programs (ACBSP), you’ll be equipped with management and supervisory skills you need to excel in an entry-level or mid-level position at a small, midsize or large organization. While learning from faculty who have years of experience in innovative industries, you’ll be able to take advantage of the convenient online format that allows you to complete your studies on your own time. Our online business management degree provides you with a strong foundation in business management as you learn both its practical and ethical standpoints. 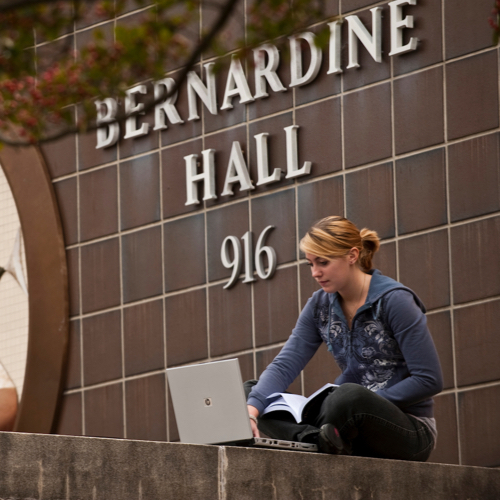 For those interested in Alvernia’s on-campus program, click here to learn more. The online business management degree’s Liberal Arts Core makes up 31-55 credits, and major requirements consist of 57 credits. To fulfill the remaining 123 credits needed for completion, you must choose general elective courses. All Alvernia University students are required to complete between 31-55 credits toward the Liberal Arts Core. Transfer work may be applicable for this area. As part of the application process, students receive specific information regarding remaining credits. Students entering the program with 70 or more transfer credits or an associate degree must complete 30-31 Liberal Arts Core credit hours. A total of 123 credits, including three credits in a human diversity course, are required to earn a bachelor’s degree. To adhere to Franciscan values, community service hours are also required. Provides a foundation of business knowledge. Students are exposed to major facets of the business world that affect everyday decision making including: types of organizations, ethics, environmental impact, economics, management, marketing, and financial management. Enrollment is restricted to non-business majors and business majors with no more than six credits in business. Provides an analysis of the traditional functions of management (i.e., planning, organizing, leading and controlling) with past, present and future application. Topics examined include quality issues, team-based approaches to work, organizational design and re-engineering efforts, motivational techniques, globalization, technology, diversity and ethics. An introduction to the basic functions of marketing and the marketing concept. Included topics of study are market analysis, consumer behavior, marketing research, the development of the marketing mix, and international and social marketing. The study of human resources in the management of the organization. Emphasis placed on understanding human resource planning, talent acquisition and talent management, total rewards management, and the human resource practitioner as a strategic partner. Impact of Human Resource Information Systems (HRIS), legislative issues, work design techniques discussed as well as other issues affecting human capital, including: Employee Assistance Plans (EAP), discipline and discharge practices. Prerequisite: BUS 206. Examines the nature of international business within domestic, international and foreign environments. Financial, economic, socioeconomic, physical, political, sociocultural, legal, labor, competitive and distributive forces that have an impact on businesses are explored. Current trends shaping corporate strategies are analyzed. This course fulfills the human diversity graduation requirement. A comprehensive study of labor relations including the development and structure of unions, union security and the role of business and government in wage determination. Approaches to negotiation, mediation, conflict, and stakeholder dialogue as a key component in the resolution process will be discussed and practiced. Fundamental concepts, issues and techniques used to plan, analyze and control systems of production. Investigate operational problems in producing goods and services. Case analysis to include topics in making quality happen, logistics of planning production, managing inventories, dealing with capacity change, opportunities for vertical integration and operations strategy. Prerequisites: BUS 206; and MAT 208 or 209. Deals with the meaning and functions of business law as applied to negotiable contracts, sales, agency employment, real property, insurance, labor, anti-trust law, consumer protection, and other legal issues such as international, environmental, privacy, tort and criminal law. Provides in-depth analysis of financial markets and how those markets facilitate the flow of funds to accommodate the needs of individuals, corporations, governments and the global market. The purpose is to study and understand the roles of the financial intermediaries in the market and how they direct funds in an ethical business manner. Prerequisite: ECON 248 or 249. The role of the financial manager in the modern business organization is stressed. Topics include time value of money, financial analysis, risk analysis, financial forecasting, cost of capital, stock and bond valuation models, capital budgeting, investment decisions under conditions of uncertainty, long-term financial alternatives, and dividend policy. Prerequisite: BUS 200 or 250. Study of development and implementation of strategic plans conceived by executive level management. Students integrate previously studied topics in the business core curriculum along with new information dealing specifically with strategic management. Utilization of in-depth case studies allows students to sharpen their skills of analysis and to develop coherent and comprehensive strategic plans. Prerequisite: BUS 200 or 250; Pre- or Co-requisite: BUS 411; Senior-level standing. Explores the challenges and opportunities experienced in starting and managing a small business. Emphasis is placed on the planning, financing, accounting, marketing, and management skills required to build a successful business enterprise. The importance of business innovation and specific management techniques will be explored. Prerequisites: BUS 200 or 250; and BUS 206. Emphasizes career goals and objectives while developing professional skills and self-presentation. Research into current developments in the business field, corporate culture, team building, networking, and business etiquette is explored. This course is the business capstone course. Prerequisite: junior or senior standing. Students must have successfully completed 30 credits at Alvernia. Students with over 3 years of full-time professional experience may substitute a business elective with the program director’s approval. This course meets the Writing Enhanced requirement. Analyzes organizations in terms of structure, authority, culture, managerial philosophy and ethical scrutiny. Students learn theories of human perception, communication, motivation, organizational culture and change, and apply these theories to practice through research, experiential exercises and case studies. Surveys the performance of the American economic system through National Income Accounting with emphasis on the aggregates of government, consumers and business. The focus is on total employment, total income, total output, general level of prices and the major current problems of unemployment, inflation, and fiscal and monetary policy. Surveys behavior of individual economic units (household and business firms) and the price mechanism interacting in the market structures of American capitalism. Emphasis is on the specific product price and specific amount of production in an efficient and profit-oriented competitive economic system. This course in applications of statistics and probability is designed for such areas as sociology, business, economics, medicine and psychology. Topics include descriptive statistics, data organization and graphical methods, laws of probability, rules review of probability, linear correlation and regression, binomial and normal distributions, sampling and statistical inference. Varied computer applications, using the statistical software package SPSS, are required. Not open to math or science majors. Students earning credit for this course cannot earn credit for MAT 209. Prerequisite: satisfactory score on the Mathematics Placement Test. The use of accounting data for managerial planning and control. Cost flows, cost-volume-profit analysis, capital budgeting, and pricing strategies are among the major topics included. Not for accounting majors. Prerequisite: BUS 101. Builds upon and expands fundamental accounting principles covered in Bus 101. Use of corporate asset, debt and equity accounts, preparation and analysis of financial statements, and impact of cash flow are highlighted. Prerequisite: BUS 101. Discussion of the design, implementation, and improvement of accounting systems while emphasizing the role technology plays in each phase. A systems approach to the gathering, processing, summarizing, and reporting of financial information is key. The implementation of internal controls is also stressed. General ledger, financial reporting, receivables, payables, inventory, and payroll are among the specific areas of application students experience through an automated accounting package. Prerequisite: BUS 101. Examines the hardware and software components of information systems and the strategic uses of information. Topics include DSS (decision support systems), Executive Information Systems, AI (artificial intelligence), Expert Systems, and information ethics. The focus is on the Internet as an information tool and on E-commerce. * C grade or higher must be obtained for starred courses. Time to completion varies by student, depending on individual progress and credits transferred, if applicable. Fees are charged per semester unless otherwise noted. This program takes four years to complete, depending on transfer credits. For a personalized estimate of time to completion, call an enrollment counselor at (888) 536-1251 or request more information. Alvernia offers loans, grants, scholarships, payment plans and GI Bill benefits to help make your education more affordable. Our enrollment counselors can help you determine your financial aid eligibility. For more information, visit our Financial Aid page. Alvernia University is a proud participant in the Yellow Ribbon Program. The Yellow Ribbon Program, a provision of the GI Bill, provides those who served the U.S. military on active duty with free tuition and fees, as well as a book allowance. For more information, visit our Veterans page. We’re dedicated to your success. Our enrollment counselors will assist you through every step of your college career, from enrollment to tuition and more. With the convenience of studying online, you can learn whenever and wherever you’d like.